As an eye care expert serving the Upper Arlington area, Drs. Min and Sims have the opportunity to use their expertise as optometrists to offer supreme eye care services for both children and adults. Dr. Min specializes in LASIK, as well as contact lens fittings. Dr. Sims has a special interest in children’s vision issues, and specializes in pediatrics, binocular vision and vision therapy. 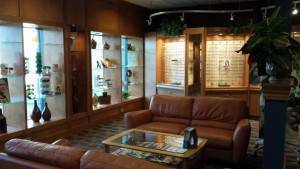 Need an Eye Exam in Upper Arlington, OH? At our eye care clinic we offer comprehensive eye examinations, using the latest optometry techniques and equipment. Any consultation at Northwest Vision starts with a detailed vision test that includes simple testing techniques such as the “old fashioned” eye chart test as well as advanced digital imaging technologies, such as OCT scans, that help your eye doctor near Upper Arlington detect and measure any future changes to your retina. Next time you visit us for your annual eye exam, we will be able to detect even the slightest changes to your eyesight, by comparing the images from your current vision test to the results of your last year’s eye exam. Looking for the Best Pediatric Eye Exam in Upper Arlington, OH? Dr. Sims has years of experience treating children, and has an easygoing, friendly and warm approach to children needing an eye exam. She specializes in vision therapy, so if you suspect your child has a vision problem that is not being addressed by eyewear, schedule a consultation with her today. Looking for Designer Eyewear, or the newest in Contact Lens Technology? You are welcome to visit our optical boutique and browse our vast selection of designer frames and sunglasses. Our opticians will be happy to assist you in choosing the right pair of glasses that suits your vision needs and compliments your facial features and complexion. However if you prefer contact lenses, don’t hesitate to consult Dr. Min about which contact lenses will best suit your eyes. We carry contact lenses by leading brands, suitable for daily, or weekly schedule. Today contact lens options are almost endless, so if you suffer of astigmatism, dry eye or presbyopia, our eye care expert in Upper Arlington will find the perfect contact lens solution for your particular needs.